Centre for United Nations Peacekeeping (CUNPK) celebrated the UN Peacekeeping Day on 29 May 2015 at the Manekshaw Centre in Delhi Cantt. Lt Gen Philip Campose, the Vice Chief of Army Staff was the Chief Guest at the function. The event is part of the worldwide celebrations undertaken on the day to commemorate all brave men and women who have contributed towards establishing peace and security in the war torn countries and ravaged societies across the world. The officials acknowledged the contribution of the Indian Armed Forces in about 50 peacekeeping missions across the world and remembered all those valiant soldiers who laid down their life in the line of duty at a place away from their homeland. The event was marked by a seminar on issues pertaining to peacekeeping and its Challenges in Today’s Dynamically Changing World. Various dignitaries including Lt Gen I S Singha, Lt Gen Satish Nambiar (Retd), Lt Gen RK Mehta (Retd), Ms Rebecca Tavares from UN Women and Mr Munu Mahawar , JS (UNP) Division were also present on the occasion. Earlier, the Secretary General’s address was read out to the gathering by Mrs Kiran Mehra Kerpelman, Director, United Nations Information Center, New Delhi. The Address of Mrs Sushma Swaraj, Hon’ble Minister of External Affairs, Govt of India, was also read by Shri Munu Mahawar, JS (UNP) of MEA. To commemorate the International Day of United Nations Peacekeepers on 29th May, 2015 the Permanent Mission of India to UN hosted a somber function for all the recipients of the 125 Dag Hammarskjold Medals awarded this year by the United Nations. Ambassador Asoke Kumar Mukerji, Permanent Representative of India to United Nations welcomed the awardees and read out Hon’ble External Affairs Minister of India’s message on the UN’s commemoration of International Day of Peacekeepers. Full text of Hon'ble External Affairs Minister’s message on the commemoration of International Day of UN Peacekeepers is placed below at Annex-I. During the commemorative function a unique initiative was undertaken by the Indian Mission to UN, whereby a Virtual Memorial Wall was launched and dedicated to those Indian troops who gave their lives while doing active service as UN peacekeepers. 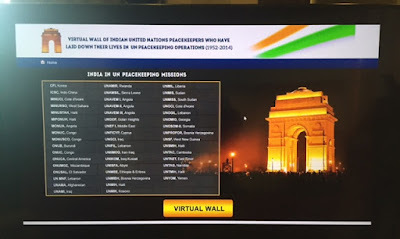 This Indian initiative is a precursor to the eventual construction of a UN Peacekeepers Memorial Wall on the premises of the United Nations Headquarters in New York. India had proposed the construction of the UN Peacekeepers Memorial Wall as an appropriate way to commemorate all the troops from member states of the United Nations who had given their lives while on duty under the Blue Flag of the United Nations. The proposal for the establishment of the Memorial Wall at the United Nations Peacekeepers Memorial at Headquarters has been recommended by the Special Committee on Peacekeeping Operations in its report A/69/19 (Para 19). The recommendation is under consideration in the Special Political and Decolonization Committee as a part of draft proposals in the Fourth Committee document A/C.4/69/L.19. Since attaining independence in 1947, India has steadfastly responded to calls from the United Nations Security Council to contribute troops as UN peacekeepers for maintaining international peace and security. India’s consistent and substantive response over the past seven decades of UN peacekeeping operations has resulted in more than 180,000 Indian troops having participated in 44 of the 69 UN peacekeeping operations mandated by the UN Security Council so far. India is proud of being the single largest contributor to UN peacekeeping. The high degree of professionalism and courage displayed by Indian UN peacekeepers have extracted their costs in terms of human lives. 161 Indian UN peacekeepers have made the supreme sacrifice while on active duty with the United Nations. 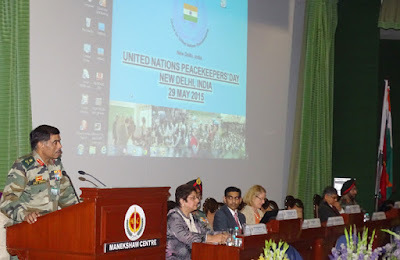 In order to keep their memory alive, and to highlight the significant contribution these dedicated professional troops have made to the objectives and purposes of the United Nations Charter, the Permanent Mission of India to the United Nations has been actively engaged in enhancing the commemoration of the International Day of UN Peacekeepers on 29 May every year. Two years ago, on 29 May 2013, to mark the 10th anniversary of the International Day of UN Peacekeepers, the Permanent Mission of India to the United Nations had organized a photo exhibition showcasing the historical origins of India’s UN peacekeeping participation and scenes from the various areas of operation where Indian peacekeepers have been deployed over the past 60 years. In 2014, at India’s initiative, the UN General Assembly agreed for the first time in its Resolution No. A/67/287 to request the Secretary General of the United Nations to place a wreath at the UN Peacekeepers Memorial, located on the UN Headquarters premises, on 29 May every year. 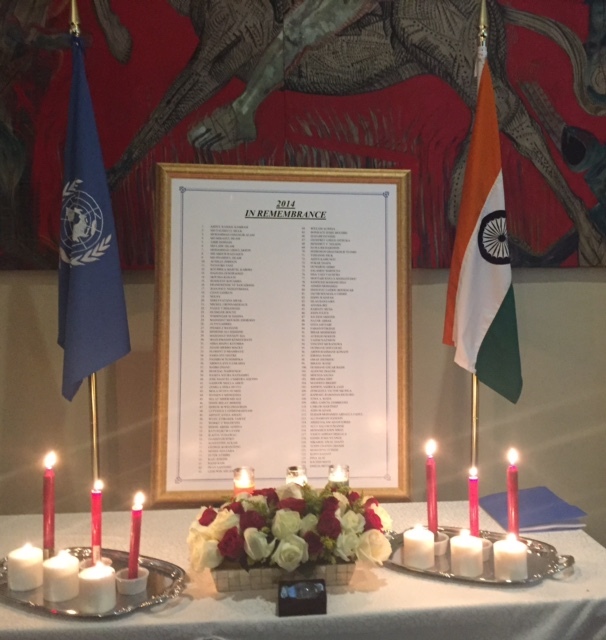 That same day, for the first time, an inclusive commemorative reception was hosted by India at the United Nations Headquarters in memory of all the 106 UN peacekeepers from different member states of the United Nations, who had laid down their lives in service of the United Nations during 2013. On 2 October 2014, Her Excellency Smt. Sushma Swaraj, External Affairs Minister of India, became the first foreign minister from any member state of the United Nations to place a wreath at the UN Peacekeepers Memorial in New York. Today’s function to honour the memory of Indian peacekeepers was also attended by Mr. Atul Khare, Under Secretary General for Field Support along with Mr. Herve Ladsous, Under Secretary General for Department of Peace Keeping Operations, who both paid glowing tributes to the sacrifices made by Indian peacekeepers in UN peace keeping operations.